All transactions are safe and secure with a reliable history in online purchasing behind each of our associates. 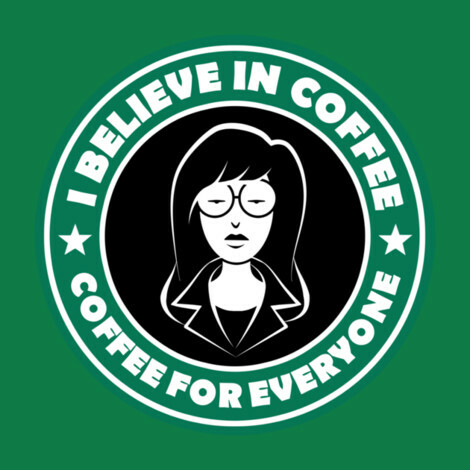 Buy the Daria Coffee for Everyone t-shirt to own Daria clothing and merchandise. She has her eye on you...don't worry, she watches everyone. How else would she be able to get ammo to criticize people for their indiscretions? If you get a kick out of her observations, then snag one of these Daria logo shirts that feature a special blend of Daria, as in she's part of a well known coffee logo. "I believe in coffee. Coffee for everyone." The logo is available in a variety of options, just like your coffee. The shirt color can also be adjusted so you can get exactly what you are looking for. The leading lady herself couldn't find anything to criticize regarding this tee. In addition to the Daria Coffee for Everyone tee above, browse the Daria Clothing Gallery for more apparel like men's and women's clothes, kids shirts or hoodies.